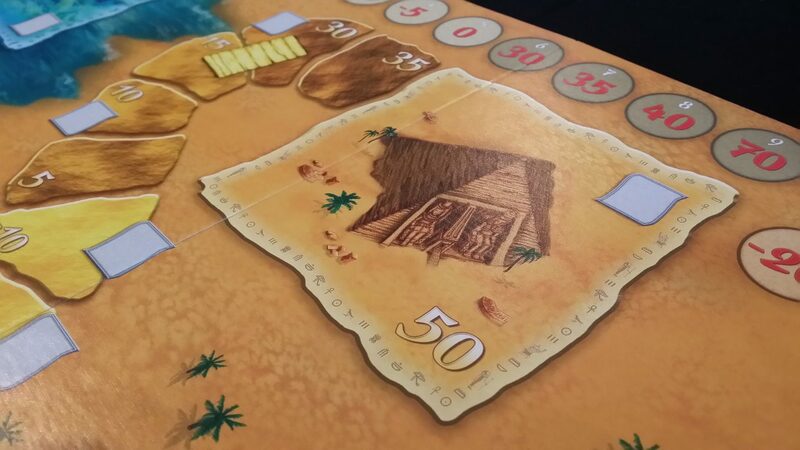 Lost Cities: The Board Game is a competent, albeit entirely unexciting, reinterpretation of the Lost Cities Card Game. We gave it three stars in our review – you might like it, at least a few times, but the fun wears out pretty quickly. But why should you listen to us? The Internet is stuffed full of idiots telling you what they think about games, and you can make your own mind up without us trying to influence you. What’s more important is that you *can* play it if you want to. Let’s grab our best whips, wear our best fedoras, and venture out into the jungles of accessibility to see what we find. It’s pretty good! 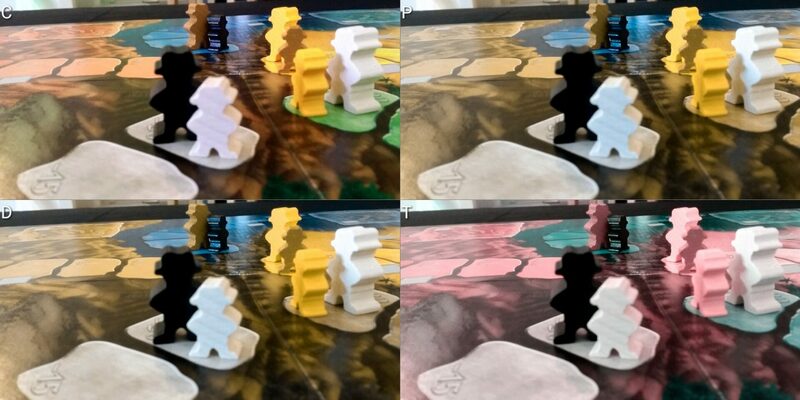 The brown and yellow meeples are reasonably well differentiated for all kinds of colour blindness – even with four players, you’re unlikely to get mixed up as to which adventurer belongs to you. It gets a pretty easy pass on its colour palette for adventurers. In terms of the paths and the cards, the colours are a little bit more troublesome – green and blue are a problem for those with Tritanopia, and red and yellow are a problem for those with Protanopia or Deuteranopia. Two roads diverged in a… is that two? Maybe it’s just one. It’s hard to say. But here Lost Cities shows the power of redundant channels of information. Each city has its own graphical symbol on the board, and this is matched by the symbol on the card. All you need to do is look and see the symbol on your desired destination city to know what cards you need to play. It completely solves the problem that the palette would otherwise introduce. I spend a lot of my time complaining about colour choice in these teardowns. I am always extremely happy when I can be more positive. Lost Cities is strongly recommended in this category. The cards are of reasonable size and the numbers are easy to see – that’s good. 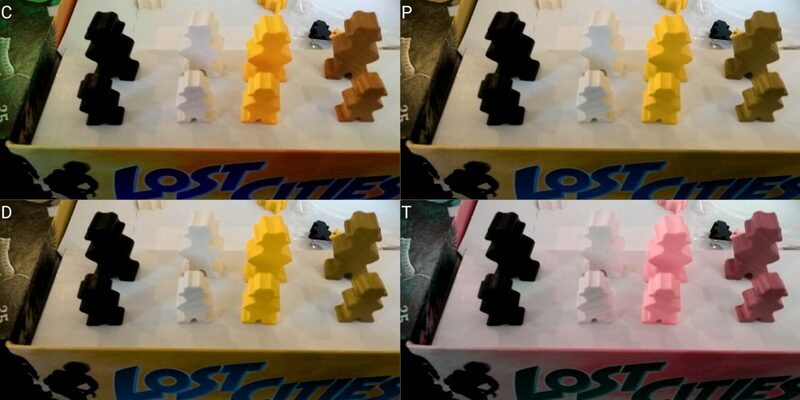 However, some of the meeples have low contrast against particular paths. That’s not good. Yellow meeples on the path to the desert city, and white meeples on the path to the ice city have a tendency to bleed into the background. Obviously viewing angle can make the difference here, but it would be nice if it didn’t have to especially if we have to take binocularity of vision into account. White on white? Turns out, that’s not great contrast. 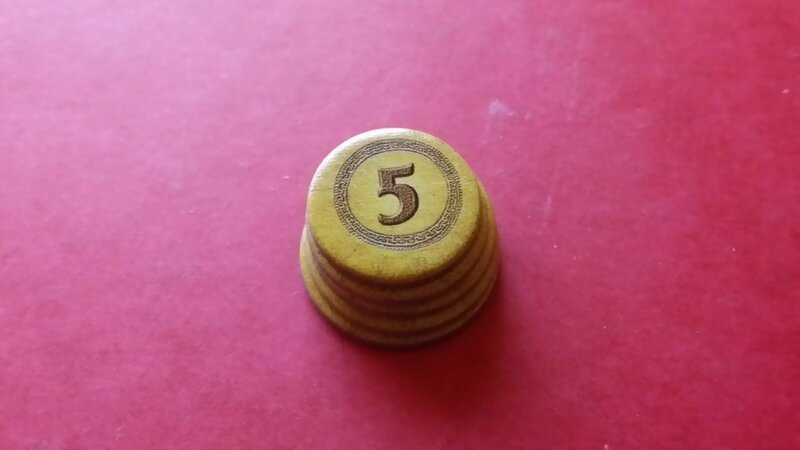 This is partially an element of the game design – victory tokens are supposed to be kept face-down so nobody knows who is winning, and having tactile markers on each coin would defeat the purpose somewhat. However, you could have tactile indicators for coins whilst still allowing for a hidden tally by simply using a cup or a bag. Nonetheless, the game is recommended in this category, albeit only for those that have some degree of visual discrimination. it won’t be possible for those that are totally blind to play given the nature of the card matching and counting of progress. As with many recommendations in this category, we would expect someone at the table to be able to provide help and guidance in terms of visual support. If all have visual impairments it’s still possible to play with care. Do I want to start climbing this path using the lowest card I have available? How many steps up the path can I take with the cards I have in my hand? How many usable cards of the type I need are likely still in the deck? Do I play this path with an archaeologist or a researcher? Is it safe for me to discard a bad card, or will someone else grab it? None of those are complex decisions – when taken together, they offer a modicum of strategic depth, but not so much that it would meaningfully prohibit someone with cognitive difficulties to play. There is no required reading, and the complexity of the game state is very low – there are hidden hands, but also public hands that show what cards everyone has played. Most of the state of the game is arrayed in front of you, minimising burden in terms of memory and fluid intelligence. Encountering stairs on a pathway can move *any* of your explorers up *any* path. If an explorer has reached the city, playing valid cards of that city can be used to progress *any* of your explorers. Artifacts are removed from a path when passed by a player. 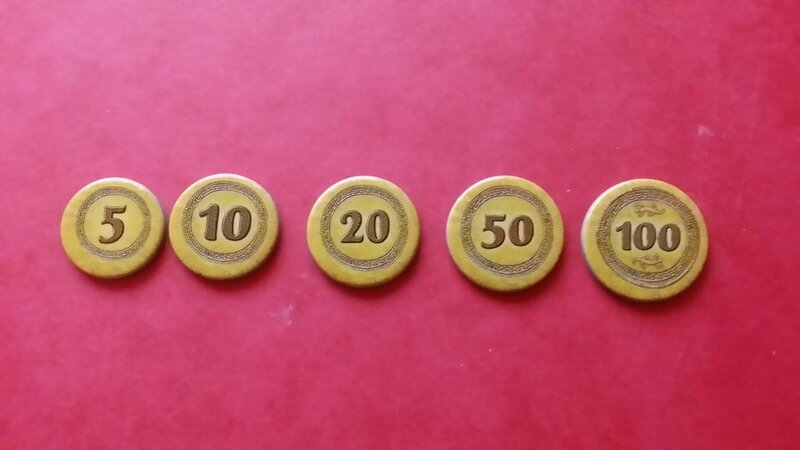 Other tokens remain. When playing a short game (one single expedition), use the short scoring track. When playing a full game, use the full scoring track. These are conditional rules, but they aren’t complex rules. We expect that the game can be played, and meaningfully enjoyed, with most categories of minor to moderate cognitive impairment. 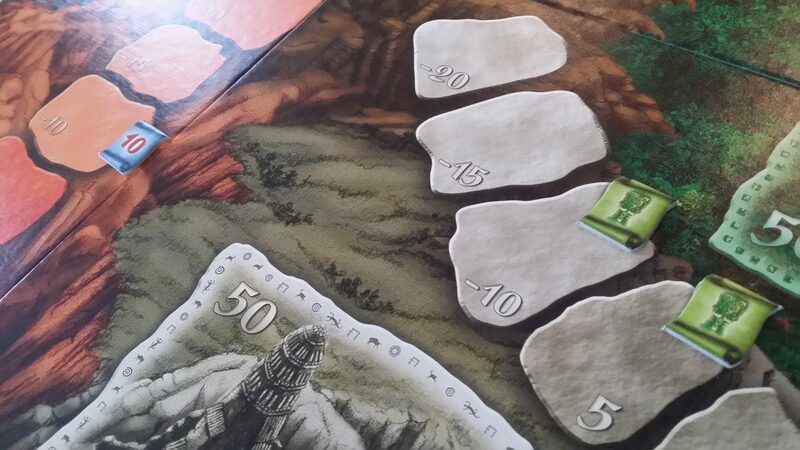 As usual, we recommend that if cognitive impairments are severe that you focus instead on the game and not the scoring, and here we encounter one of the neater features of Lost Cities: The Board Game. It’s also Lost Cities: The Card Game. You can modify the deck to play Lost Cities without the board and the progress tracking – just download the game rules, and away you go. If cognitive impairments would prohibit the board game, this is a simpler version that would open up play to a wide range of people. The only real contention in the game is over the discard pile and the artifacts – otherwise, the only limited resource in the game is time. Once five explorers have passed a bridge, the expedition is over. That would make it a clear, easy recommendation here – but read on. You need to make a minimum amount of progression each route to get a positive score – negative scores are common for individual journeys, and that’s always a tricky needle to thread in a group that includes someone with emotional issues. That, and the power of a well-placed researcher, can lead to some very significant scoring disparities. There’s no guarantee that in any given game session your luck will even out. It’s entirely possible to have three miserable expeditions in a row while someone else has three fantastic ones. When you’re sitting on negative points and someone else has triple digits and an unbearable grin on their face, it can easily be the accelerant that turns a simmering, low-grade frustration into a full-blown tantrum. 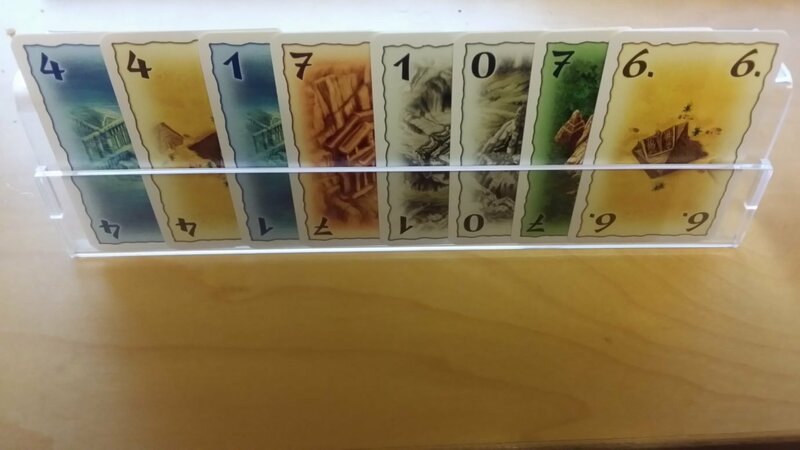 But, the good news is that the game comes with an official variant in the rules – when you start a journey, you get to choose whether or not that card pile is counting down or counting up. Each path can have its own direction of travel, and each player can choose the direction that works for their hand. Obviously, this changes the dynamic of the game dramatically, but it does eliminate the single most potentially infuriating element of gameplay. We recommend it in this category, but we’d also recommend you make use of this variant to cool potential tensions with unsatisfying progress. Each player has a hand of eight cards, and will play those cards into one of five coloured piles in front of them. The hands aren’t so large that they will create a significant accessibility issue, especially if they are paired with a standard card holder. As with many games of this nature, it helps a lot of you can do in-hand management to sort by colours and order them by number, but there aren’t so many cards that it’s absolutely mandatory. More troublesome is the card shuffling – this is obviously a feature in any game involving drawing from a randomised deck, but it’s especially an issue here. 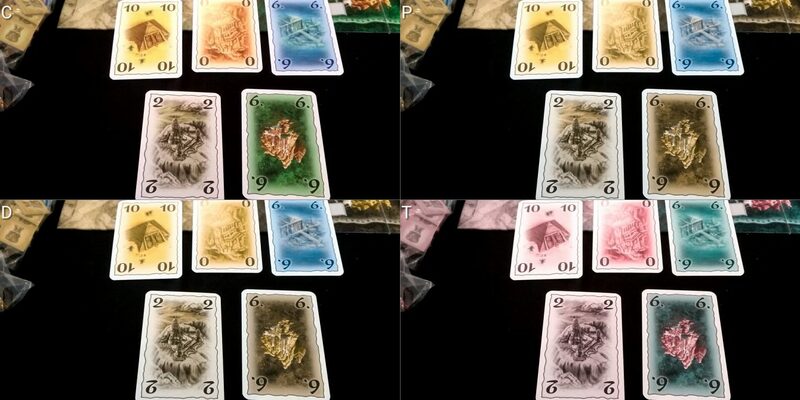 The nature of the gameplay causes cards to naturally clump together into colours and ascending (or descending) order. When they’re collected up for future expeditions the deck has a natural tendency to ‘deshuffle’ itself to a large degree. With three expeditions per game, you’re going to need to invest a large amount of effort into ensuring suitable randomness. There are one hundred and ten cards in the standard deck, too – you’re shuffling slightly more than two standard playing decks at a time. It’s a lot of shuffling of a lot of cards, although you only need to do it once per expedition. The victory point tokens are very small and fiddly, as are the artifact tokens that you get at the end of each expedition. 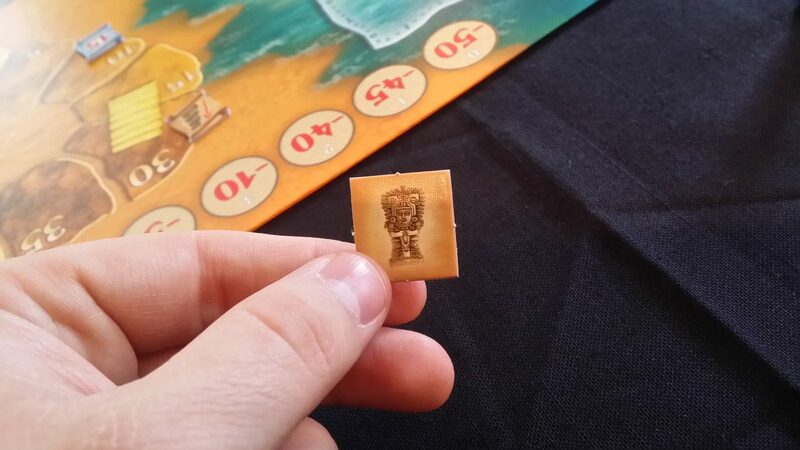 The treasure tokens that are spread around the map are tiny and difficult to position – and sometimes you’ll need to pick them up and bring them to your side of the table. 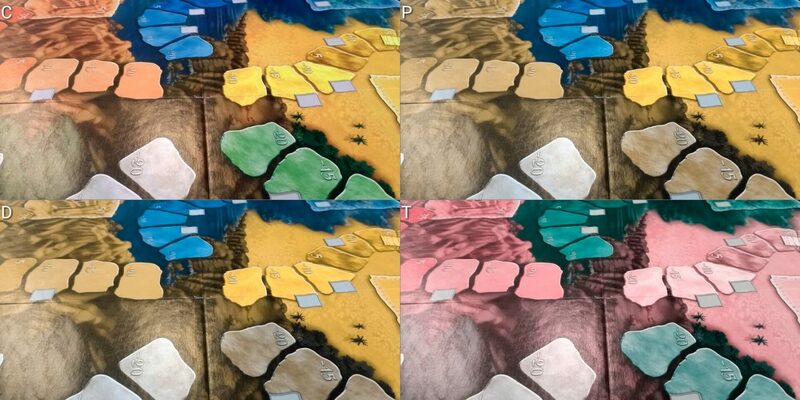 The meeple tokens though are substantial and easy to manipulate, and there is little need for fine-grained positioning on the board – the dimensions of each step aren’t particularly generous, but they’re also not particularly stingy. Play my third card and move me up the white path. Discard my fourth card to the blue pile and pick up the one on the green pile. Play my fifth card to move me one up the blue path, and for the stair action move my explorer one further up the red path. Nothing about it is complex or time-constrained – if agency is not an important or feasible consideration, there are no barriers to having anyone action your moves on a turn by turn basis. We recommend, for the most part, Lost Cities in this category. No communication is required of gameplay, and no written instructions are present in the cards or on the game board. No matter your category of communication impairment, you can play this effectively. The box art shows a man and a figure of indeterminate gender on the front. It looks very much like a guy to me, but you can imagine it’s a woman if you like. I would have preferred to see that explicitly represented, rather than making people imagine it, especially since the manual has a tendency to refer to the explorers as ‘he’ and ‘him’. 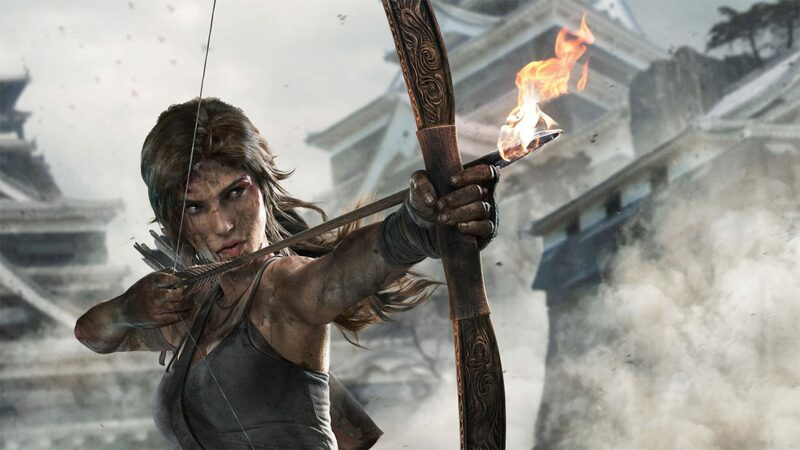 Having said that, maybe it’s just difficult to represent a woman in the role of a brave explorer risking life and limb to explore ancient ruins for glorious treasure. As with Forbidden Desert, there’s an implication in the game theme. We’re explorers, collecting ancient relics in some forgotten landscape. It’s never explicitly stated that we’re out and out robbing a culture of its historical artefacts, but the rules definitely subtly imply it – we’re ‘paid’ for our treasures, as the manual phrases it. You can easily put this aside and assume more noble reasons for the expeditions, but that implication might well be off putting to some. 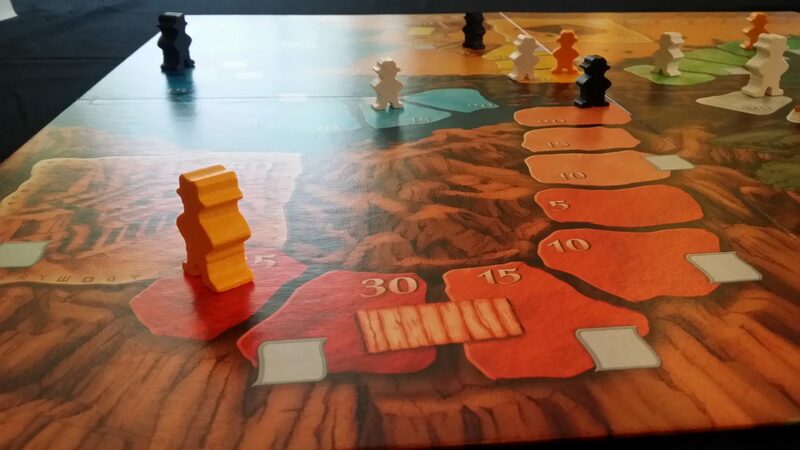 There may be a certain amount of projection here too, but the meeples look very much like the stereotypical explorers of early 20th century western Egyptology, and they were hardly respectful of national right to antiquity. The game weighs in at a reasonably hefty £32, and it’s hard to interpret that generously given all you get is a few meeples, some cardboard tokens, a deck of cards and a board. But, as outlined above, you do get the Lost Cities: Card Game for free if you download the free rules from the Internet. That’s not enough of an extra to really justify the price, but it softens the blow a little bit. It just seems too expensive for what you get. The flexibility in the player count though may justify the cost if you’re looking to maximise family enjoyment – it works well with two players, and goes up to four. If you need to support more players than that, you’d likely find more value with other titles. That’s especially true given the lack of replayability – you’ll enjoy it a few times, but I suspect you’re unlikely to find many reasons to take it down from the shelf once you’ve got the hang of it. We recommend it in this category, but not especially strongly. It could easily have done much better – a gender balance on the front, explicitly dealing with the troublesome theme connotations, and lowering the price to ensure more value for money. Having hidden hands brings with it the usual issues associated with intersections of physical and cognitive impairment. If nobody should be looking at your hand, it’s difficult for people to help if you’re having problems. Having said that, the impact of anyone knowing what you have is minimal since the key, critical information is face up and public. You don’t really need to know what cards someone has in their hand, you just need to know the lowest card that is safe for you to discard. Those with visual impairments and physical impairments may find it difficult to make out certain meeples on certain paths, depending on what constitutes a comfortable viewing angle and how easily that angle can be changed to shift perspective. Lost Cities has an interesting intersectional issue with regards to emotiveness and cognitive impairment – we recommended above making use of the optional directionality rule when dealing with players that may get angry or frustrated. However, this adds a significant cognitive cost to play because everyone has to remember what direction of travel is implied by which pile, and it makes the job of deciding what is a safe discard much more difficult. Emotive issues are often interlinked with cognitive impairments, and this is an important thing to bear in mind when assessing whether or not Lost Cities is an appropriate game for your players. Lost Cities doesn’t support meaningful dropping in and out, and the length of the full game can be reasonably long. Three expeditions is a lot, and moving to the short rules hugely impacts on the extent to which luck is a factor in victory. With the long game, there’s a chance bad luck will even out. With the short game, if you get dealt an initial bad run of cards you may as well give up there and then. A player dropping out mid-game won’t just stop progress up the paths, they’ll also potentially lock up valuable cards in their hand. The game does scale up and scale down reasonably flexibly though, and you can house-rule a variant where a player dropping out simply discards to the various discard piles. There’s limited player to player dependency in turns, so as long as someone is willing to leave their explorers where they ended up it wouldn’t necessarily impact on anyone else except in terms of consistency of the gaming experience. Lost Cities isn’t a game we strongly recommend – it can be fun, but it overstays its welcome and rarely justifies being invited back to the table. It’s not bad by any stretch of the imagination. It’s competent. But in case you haven’t noticed, board games are *amazing* now and it’s not enough for a designer to get away with simple competence. We expect a lot more, and we usually get it. If you fancy Lost Cities though, you can almost certainly meaningfully play it.